1. First, it’s called le marché H.L.M. That might seem like an obvious point to make, but often English-speaking newcomers to Dakar hear the market’s name spoken before they see it written. Hence the common mistake of looking on the map for a market called ‘Achelemme’. 2. 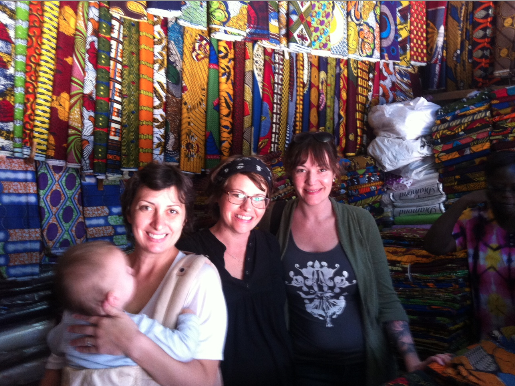 It is THE fabric market in Dakar. Wax prints, bazins of all qualities, a rainbow of brodé fabrics, lightweight khartoum cloth, lingerie and belly beads, buttons, beads, zippers, ribbons… It’s all at Achelemme HLM market. 3. Make Policier HLM 5 your first stop. Whether taking a taxi or driving, first go to the police station in the HLM 5 neighborhood. If you’re driving your own vehicle, there’s usually decent parking (and of course, guys ready to watch/wash your car while you shop). And if taking a taxi, it’s nice location to get out and get yourself settled and organized before heading into the belly of the market. 4. Get yourself organized. HLM market is not known as a hotbed for pick-pockets. Well, not any more than any other market or crowded area! 😉 But it is a good idea to carry your purse in front of you and with a hand securely covering it. If your bag has external zippers, carry it so that they are facing you and are not as accessible. 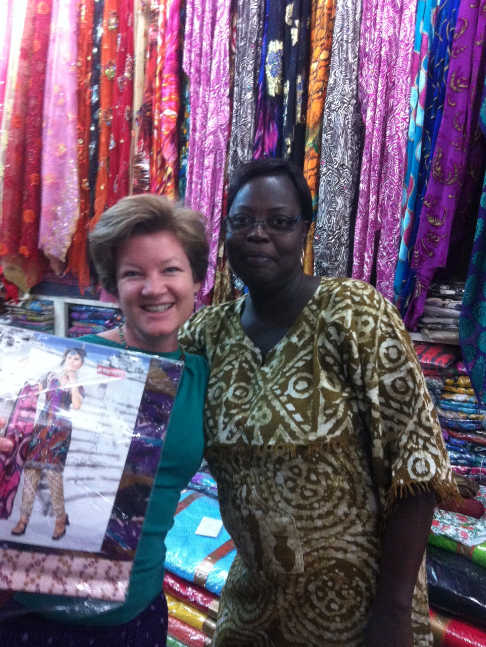 Shopping at ‘Fatou’s Secret’. Belly beads, incense, lingerie… it’s all here! 5. By the meter. Most wax fabrics come in bolts of 6 or 12 meters. But many of them (particularly the less expensive ones) can be cut so that you buy only 2 or 3 meters, depending on what you want. 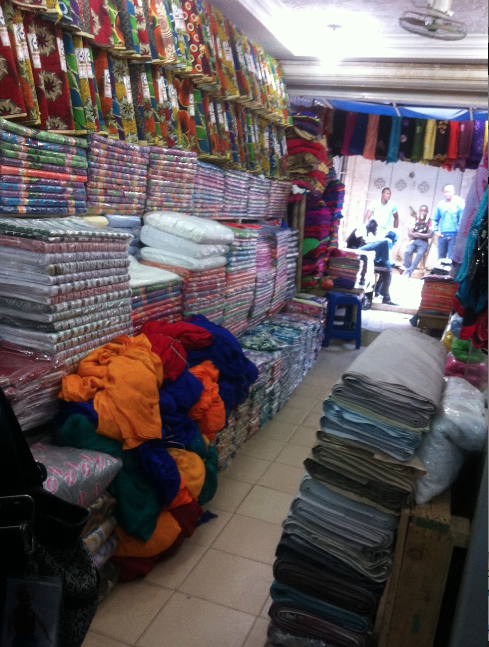 This is a great way to buy a wide selection of fabrics for just 750cfa or 1000cfa per meter. Tip: If you’re doing the charades thing, remember that the Senegalese count on fingers in the French way. So if you want two meters, hold up your thumb and index finger. For three meters, hold up your thumb, index and middle finger. 5. Meet and greet. Whether you plan to buy an item or are just giving their wares a quick look, always greet the vendor first. If you can do so in Wolof – great! But if not, ‘Hi, how are you?’ in any language + a smile will get the point across and go a long way. 7. What’s new? Don’t miss the prêt-à-porter alley. 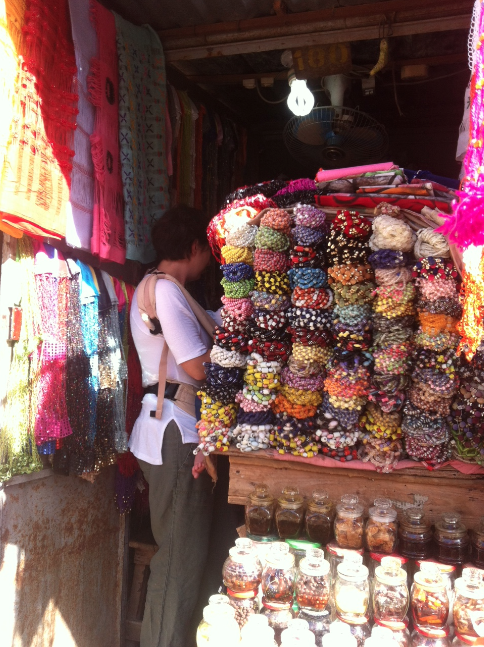 This is a strip along the center road of the market where vendors sell ready-made ensembles (mostly for women) in the latest styles and colors. If you go to HLM regularly, you will be amazed by how often the fashions change! 8. Be patient for the photo op. It’s tempting to bust out your camera and start snapping away at the colorful sights. A woman crocheting a bright green bra & thong set, a man carrying a stack of tie-dyed pareo wrap-skirts over his shoulder, piles and piles of bold prints on either side of the dusty path… If you really want photos, it’s best to wait until you’ve bought something from a vendor and then to ask permission to take photos of their shop. Interested in visiting one of Dakar’s markets? 10. Just buy it. I have never regretted a fabric purchase at HLM (and that includes the tie-dye I way overpaid for!). On the other hand, I nearly always come home wishing I had bought ‘one more meter of this one’ or ‘that really pretty purple chicken print’. Oh my gosh! 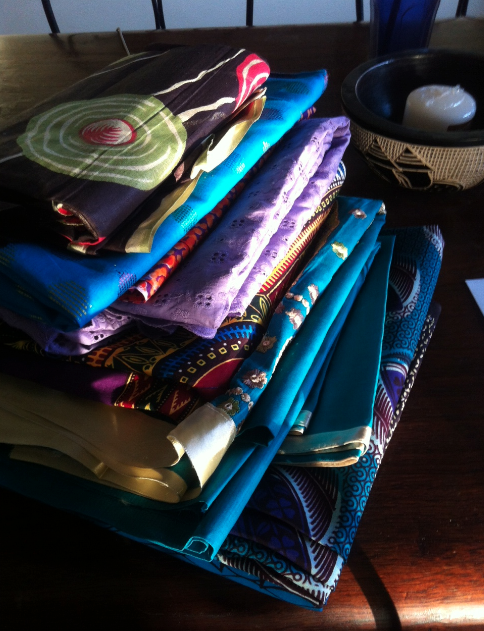 Such beautiful fabrics! How do you not buy all of them! Thanks for sharing your outing with us. patricia!!! give her a big wet one for me. HLM is my favorite market. I lived nearby the market. I used to walk to get there. I have heard that they will be closing Marché HLM for good, is it true? I hope it isn’t! Shopping with a guide seems a good idea. Hope to meet Patricia soon. I am interested in a tour of HLM at the end of May. Is Patricia on WhatsApp or another texting application? 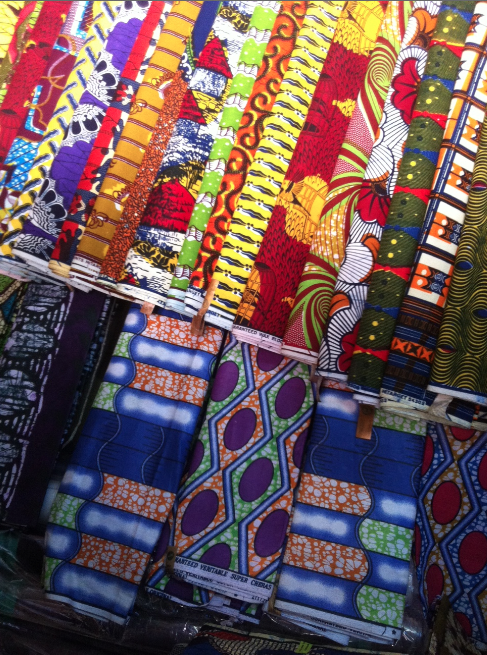 I love Senegalese fabrics! Thanks for sharing. Thanks for sharing these useful tips. I will be visiting Achelemme soon and found this very helpful.